Versatile Bow Top railings are available in a wide range of styles. With 6 decorative options they are pleasing in appearance and can be manufactured to client specifications. Easy to install, these railings are strong, durable and resistant to vandalism making them a great choice for many applications. 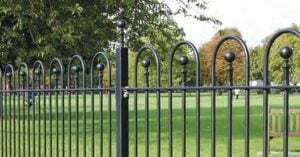 These type of railings are recommended for use around public spaces such as parks, playgrounds and other play areas. Bow Top railings are available in standard panel lengths and heights, however bespoke sizes can be manufactured to any customer specification, including nonstandard panel lengths, raking and radius panels. Bow Top railings are manufactured to comply with BS 1722 pt 9 where applicable and hot dip galvanised to BS EN ISO 1461.